"I've got a new kitten! Kitten litter box training is one of the most important things you can do to get your relationship with your new kitten off to a great start. Your efforts will be extremely effective if you follow the suggestions below. These will help your new kitten who has not already been potty-trained, and also kitties who need a little extra training. Properly training your new kitty requires your consistency, and sometimes, patience, but will absolutely pay off in the long run. Diligence and a routine will help your new kitten get the hang of going potty in the right place. 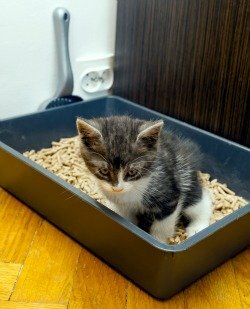 For kitten litter box training, you'll need to frequently put your kitty in the litter tray. You don't need to force her to stay in the tray until she uses it. You can let her go off and do her kitten stuff, then bring her back in about 10 minutes and try again. But keep an eye on her during these few minutes to watch for any signs of the need to go (e.g., sniffing the ground, starting to scratch an area, circling, and squatting). If you notice these signs, don't yell at your kitten. This will make her insecure and potentially cause additional problems. Just distract her by clicking your tongue—or some other silly noise—then pick her up and take her to the litter pan. As your kitten gets older, she'll develop better bladder control. You can change the frequency you take her to the box to every three hours instead of every two. If your kitten starts having accidents when you let up on the training routine, then go back to a more diligent routine. Give your kitten lots of praise when she uses the box. This will help the process. Kitten litter box training for a new kitten who is old enough to have been properly weaned (usually done around 8 weeks) can be easy. If your new family member is old enough, and you know that he or she was "house trained" before coming to your home, then you can generally follow the same litter box training steps as for adult cats (see below). But note that kittens have less bladder control than adults and will require more rigorous training than adult kitties. Litter box training kittens with this in mind will help the little tyke avoid accidents. If you aren't around all the time to monitor your kitty and take him to the box (or if you don't want to get up in the middle of the night! ), then you may want to confine the little tyke to a room where he has a litter box, food and water during the kitten litter box training period. This will prevent accidents from happening in places you definitely don't want them! Disciplining your kitten for having accidents is ineffective, unnecessary, and counter-productive. Plus, in my opinion, it's cruel. Please see Adult Cat Litter Box Training for further information about disciplining or punishing your kitten or adult cat for accidents. So if you follow the above suggestions, you should be able to train your kitten in this particular area. Remember, consistency and diligence in the beginning will pay off in the long run. See my Cat Litter Box Essentials article for all types of information about this important feline household topic.